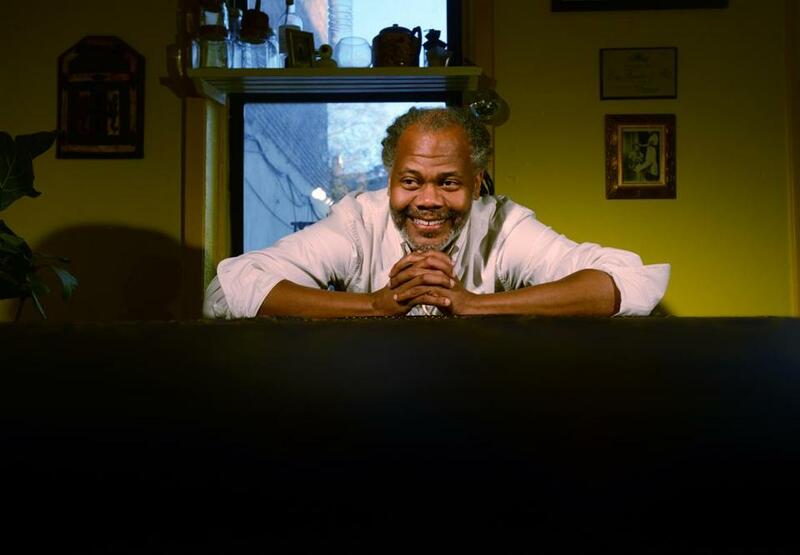 Choreographer Reggie Wilson drew upon many sources of inspiration for his work “Moses(es),” which will be performed by his Fist and Heel Performance Group at the ICA. It was a sunny day last July. Through a wall of glass at the Institute of Contemporary Art, sailboats drifted across Boston Harbor. 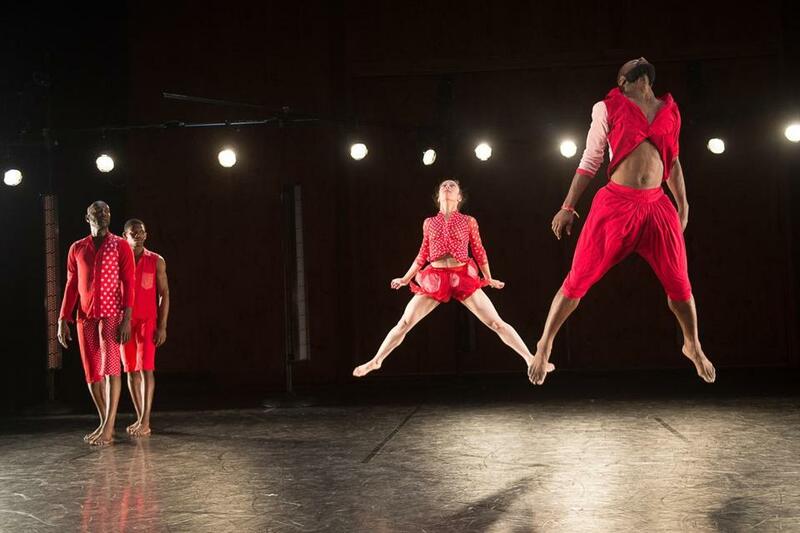 In the ICA’s theater, two dozen dancers in red had just finished presenting the results of a weeklong residency with New York-based choreographer Reggie Wilson, traversing the space now in staggered groups, now solo, arms scooping and crossing. Wilson, wearing a blue plaid flannel shirt, black jeans, and blue Converse sneakers, settled in at the museum’s cafe. The residency had been inspired by Wilson’s evening length piece “Moses(es),” which comes to the ICA on Friday. Performed by Wilson’s Fist and Heel Performance Group, “Moses(es)” (2013) is the choreographer’s latest masterwork, inspired by the connections between four seemingly far-flung sources that Wilson encountered at home in the United States and on trips to Israel, Egypt, Turkey, and Mali: Zora Neale Hurston’s 1939 “Moses, Man of the Mountain,” a retelling of the Moses story as a folktale in Southern African-American vernacular; Wilson’s experiences with Israeli choreographer Ohad Naharin, with whom he danced as a student at New York University; Zar, a mystical possession-and-healing ritual popular in the Middle East and Africa; and the culture of ancient Nubia. The sources sparked questions: How does migration — in particular, of the peoples and culture of Africa — affect our beliefs and traditions? Why does the story of Moses change as it moves across time and place: in the Torah, in the black church, in Islam? Who is a leader, and who is a follower — and what does that relationship mean regarding the transmission of customs? “ ‘Moses(es)’ is about the lenses that people use to see something, whatever it is,” said Wilson. And what you see, he added, reveals more about you than about the object itself. The idea for “Moses(es)” was sparked by a visit with Avigdor Shinan, the uncle of Wilson’s longtime dancer Anna Schon. Shinan is emeritus professor at the Hebrew University of Jerusalem; he is also a Moses scholar who is very familiar with Hurston’s “Moses.” Wilson met Shinan when he went to Israel in 2010 for an artists residency program. “The whole thing just kept lining up,” said Wilson, 47, pausing to take a bite of his crabcake po’boy. During the meeting, Shinan told him that at the beginning class of every semester, he lays out multiple images of Moses “from different places, different time periods,” said Wilson. “And he says to the students, ‘Show me your Moses and I’ll tell you who you are.’ And I was just like, Oh, that’s too good of a line to be true.” Wilson laughed at the memory. In crafting “Moses(es),” Wilson refracted and married myriad traditional and contemporary dance elements. The movement is grounded: Deep squats and wide-legged plies, rocking hips, elastic jumps, and soft rolls on the floor. The rhythms are complex, the give-and-take between the dancers in turn conversational and ritualistic. All of this is set to live vocal and recorded music that ranges from hip-hop and house to gospel, klezmer, and women’s chants from South Africa. .org, is “a never-ending pattern that repeats itself at different scales.” Much of African design, says Eglash, exhibits fractal patterns. “Fractal symmetry became more functional than it did informative or thematic — for organizing movement ideas and creating structure,” Wilson explained. Northwestern University professor Susan Manning, who served for three years as dramaturge for “Moses(es),” underlines the transformative nature of what she calls Wilson’s “choreographic genius.” Manning’s job was to develop “research clusters” on the four primary sources — Hurston, Naharin, Zar, and Nubia — and share them with the dancers and designers. She also documented the making of the work. Fist and Heel Performance Group. The performers, then — Wilson among them — carry forth the meaning in their bodies and rhythms, their patterns and interactions with one another. At the ICA last July, the dancers did the mental and physical calculus of fractal symmetry: From a common movement phrase, one added a smidgen of elbow here, another reduced a swing of the arms there. Together, they etched a road map across time, across continents. Thea Singer can be reached at thea.singer@comcast.net.